They say that when it rains, it pours. From my experience, it's definitely true. For example, it seems that when I have one idea, the idea then multiplies into many more ideas. Like when I made the Poppy Chow and then all of a sudden decided to start Muddy Budd-ifying everything under the sun. Which, by the way, I'm not through with that line of thought just yet. I promise there is more to come with that one. 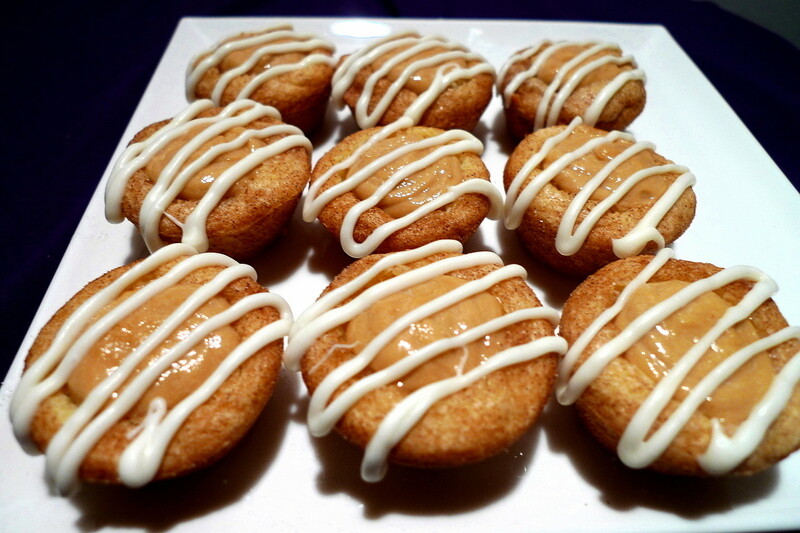 At present, there were the Orange Cheesecake Cookie Cups. After making them, I got an idea to make all sorts of different cookie cups with various fillings. Hence, I have a new line of thought that I fully intend to follow until I've exhausted all my ideas. 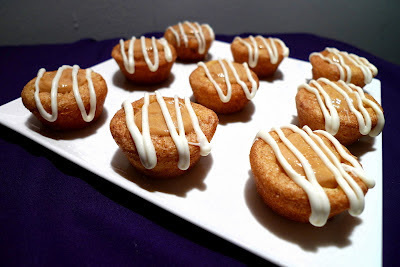 The first one up is these Snickerdoodle Cookie Cups that I filled with Biscoff Cream Cheese Frosting then drizzled with melted white chocolate. The combo of cinnamon, Biscoff, and white chocolate has seriously become one of my fave flavor combos and I love putting them together in new treats. These cookie cups were awesome! 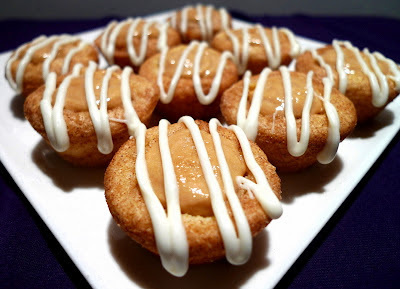 I loved every bite and the mini size is perfect for when you want just a little something sweet but don't want to overindulge. I made a lot of other different cookie cups too and can't wait to share them with you this week. For the cookie cups: Cream the butter with the sugar. Add the eggs and vanilla and beat well. Blend in the flour, cream of tartar, baking soda, and salt. Form the dough into 1 Tbsp. balls and roll in the cinnamon-sugar. 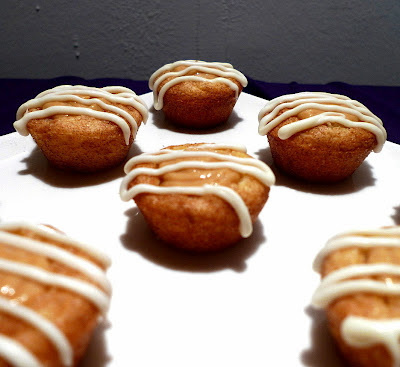 Place balls of dough in greased mini muffin tins and bake at 350F for about 13-15 min. until a toothpick comes out clean. 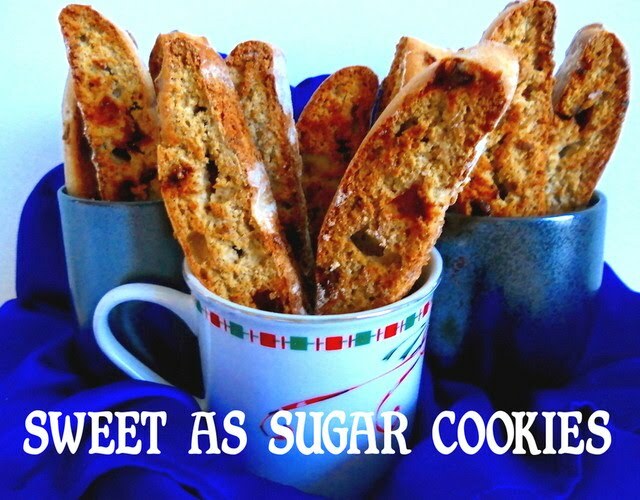 While still warm, make a little dent in the center of each cup with a small spoon or your finger (you may have to scoop out a little of each cookie - eat the scraps and enjoy). Chill the tins in the fridge for at least 30 min. before removing the cookies. For the frosting: Beat the cream cheese with the Biscoff spread until combined. Beat in the powdered sugar until fluffy. Pipe the frosting into the cookie cups. Drizzle with the melted white chocolate. Keep in the fridge until ready to serve. You had me at biscoff...I just can't resist that yummy stuff!!! And in a snickerdoodle this has to be just amazing!!! ...Oh, I'm sorry. Was that my drool hitting your screen? These look wonderful! I love the flavor combo and your creativity. Wow do those look terrific. I love your ideas gone wild. Always something wonderful. These look so yummy. I love your ideas gone wild. You always come up with something incredible. Oh boy, Lisa, these sound amazing! These look great! I love making snickerdoodles in different ways. I actually struggle a bit with the cookie version. I tend to undercook them or overcook them. I'm having a giveaway this week and would love for you to stop by and enter. Thanks!! I'm an Asian girl who loves to be in the kitchen trying out new recipes. To me, the most important things in life are my family and my faith.